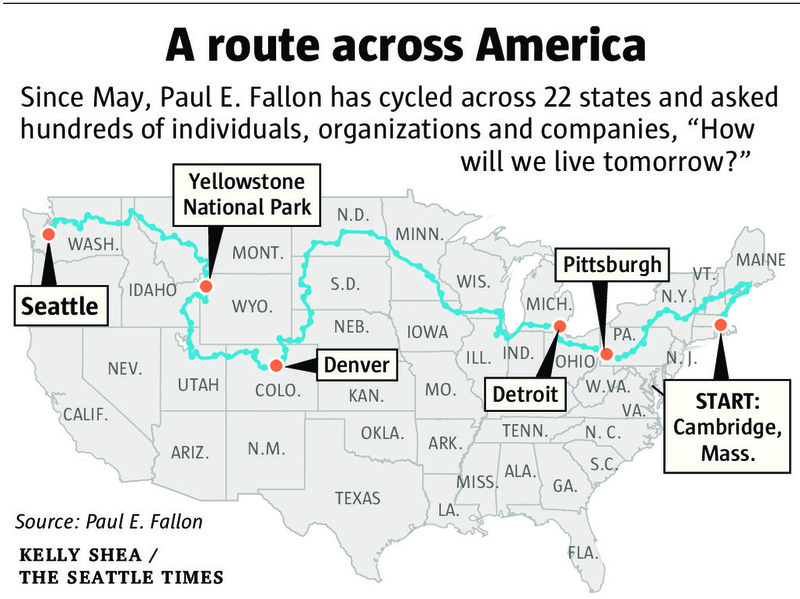 Cycling the U.S with a question: How will we live tomorrow? | How Will We Live Tomorrow? This opinion essay was published in The Seattle Times on Thursday August 27, 2015. 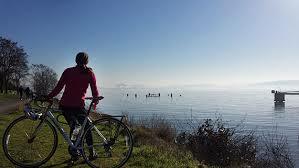 Seattle is a key terminus for many cross-country cyclists. More than half of the riders I’ve met start or end here. For me, Seattle is a turning point, the place I stop moving west and start heading south. 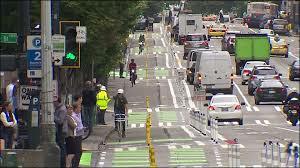 Seattle marks only the third point in my objective to pedal and pose my question in the 48 contiguous states. Still, reaching the upper left corner on the map is a significant landmark in my journey. I undertook this adventure because I love to cycle and wanted to see America at an intimate scale. More importantly, I am concerned about the negative tone of our national conversation. I’ve no confidence the 2016 election cycle will rise above partisan discord to generate the thoughtful debate we deserve. So I decided to generate my own discussions, one on one, with people I meet riding a bicycle. A guy on a bike is like a woman in pearls: my accessory earns me special attention. I supposed that people would be inclined to talk to a cyclist; I underestimated that by a wide margin. People love to talk to a guy on a bike. They seek him out. They open up. The bike sets me apart, and triggers unconstrained responses to my question. Retirees give me cold water along the road, truck drivers buy me lunch, mechanics offer me money, and gardeners give me produce. I turn down money, but I’ve learned to accept food and drink. As one collared businessman said, “You’re living the dream, man. You’ve got to let others join in.” Strangers invite me into their homes, make me supper, give me a bed, and cook me breakfast. More then stuff, I appreciate people’s concern for my safety. Nuns give me blessings; Buddhists give me Karma; Native Americans give me talismans. Evangelicals pulled me into a prayer circle in a McDonald’s. As a tiny creature crawling across this huge continent, I’m grateful for all protection. I could return to Massachusetts after I reach Seattle – most transcontinental cyclists are one-way travelers – and count my journey a success. Not that I’ve solved our nations’ problems. Rather, I’ve countered my worries with example upon example of personal generosity. This entry was posted in Published Articles and tagged Bicycle Touring, Seattle WA, The Seattle Times. Bookmark the permalink. 1 Response to Cycling the U.S with a question: How will we live tomorrow?